With the midnight deadline for Italy to resubmit its budget proposal to Brussels fast approaching, one of the two men who are effectively running Italy has just offered the clearest suggestion yet that Italy will not change its deficit and growth projections for its 2019 budget plan - setting Europe's third-largest economy on a path that could lead to billions of fines from Brussels and the prospect of a feared 'Italeave'. In comments at the palace of the prime minister, where members of Italy's council of ministers have been holed up on Tuesday, Deputy Prime Minister and La Lega leader Matteo Salvini told a group of reporters that Italy would move forward with its budget plans, regardless of what Brussels thinks, according to Italy's ANSA newswire. Reiterating the long-held position of the Italian government, Salvini said Italy's fiscal stimulus is essential to creating more jobs, offering better pension benefits and cutting taxes for many - but not all - Italians. "We are working on a budget which guarantees more jobs, more right to a pension, less taxes, not for everyone, but for many Italians. If Europe is ok with that, we’re pleased, otherwise we continue straight ahead." If Italy doesn't submit a new budget proposal with a deficit below 0.8% of GDP, in accordance with EU fiscal rules, the European Commission could seek to punish the populist government by levying billions of euros in fines, a burden that would further strain the finances of a country with the second-largest debt burden in Europe relative to GDP (second only to Greece). Salvini's comments followed remarks from his co-Deputy PM Luigi Di Maio, the leader of the anti-establishment Five Star Movement, as well as the more measured Economic Minister Giovanni Tria, who both have said that cutting the stimulus would be tantamount to "suicide" for the Italian economy. 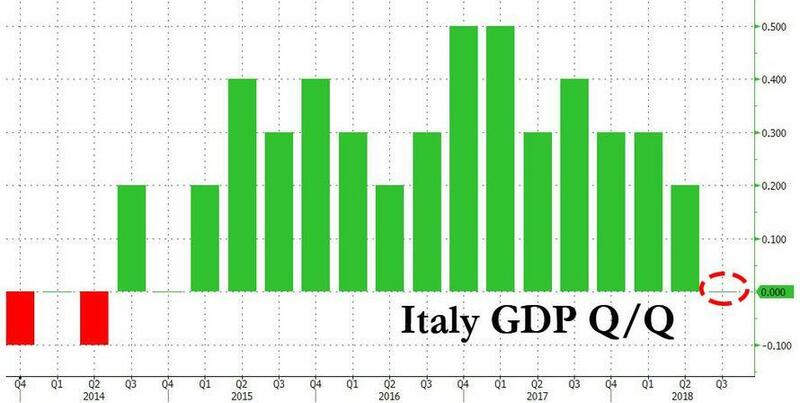 And presumably disappointing Q3 growth print, which suggested that the Italian economy stagnated last quarter, have only strengthened the populists' resolve. The euro pared its earlier gains following Salvini's comments, which effectively confirmed what many have long expected: That the Italians will thumb their noses at the European Commission after it took the unprecedented step of rejecting Italy's budget proposal last month. Meanwhile, Italian redenomination risk, which measures the likelihood that Italy will abandon the euro and resort to using the lira to pay down its debt, ticked higher as the prospect of all-out economic war with the European financial establishment prompted some to question Italy's future in the eurozone. The upshot: Based on CDS markets, the risk of Italy exiting the euro is soaring.